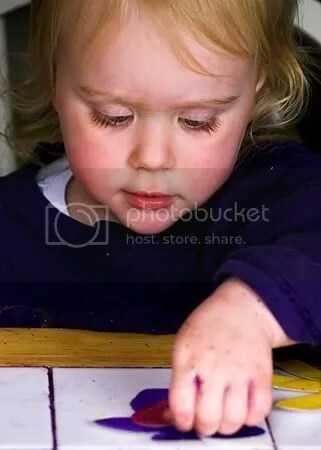 Painting is one of little Miss T’s most favoritest things to do. 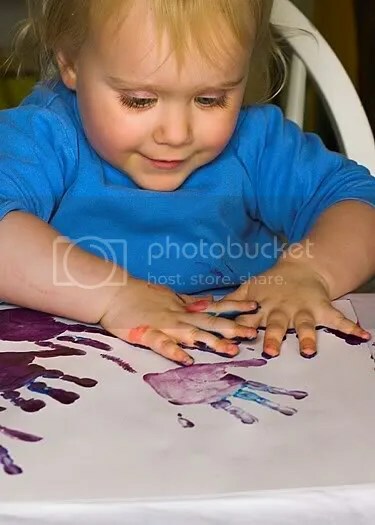 She perpetually beseeches me in her own quaint way to allow her to “make da paints.” Although I allow her to put on the proverbial coats on an almost daily basis, daubing in the poster paints is one thing that has not yet lost any modicum of appeal in her eyes. Consenting to allow very small people to slather on th’ old poster colors comes with its own set of problems, to be sure. All messiness aside, T has no notion that the end product is expected to, in some way, resemble art. 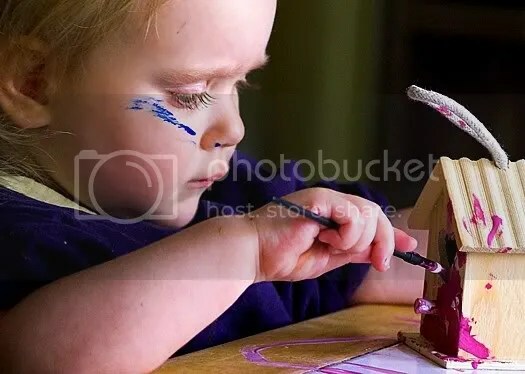 In all fairness, she hasn’t the faintest inkling of what art even is (which also holds true for most adults, I fear). 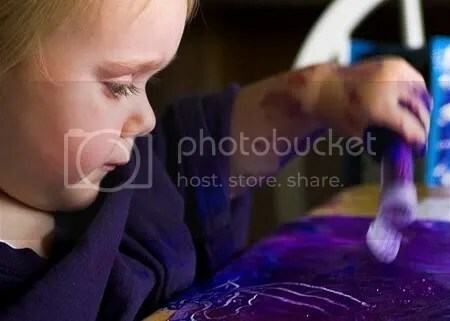 Little T’s idea of a masterpiece involves nothing more complex than smearing colors wildly until they’ve blended into a startlingly frightful shade that resembles something often found upon the dirty diaper of an infant. Then she demands more paint, and the process begins anew. Unfortunately, on occasions when said masterpieces are to be given as gifts, this colorway simply will not do. For this reason, T was forced to adhere to a limited color palate for the project at hand. I daresay she didn’t mind, or even notice, but the end result was far more appealing. 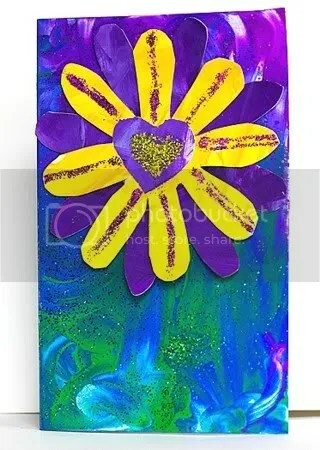 We did several paintings on cardstock. 3 of them were large, and consisted of 3-4 blendable hues each. 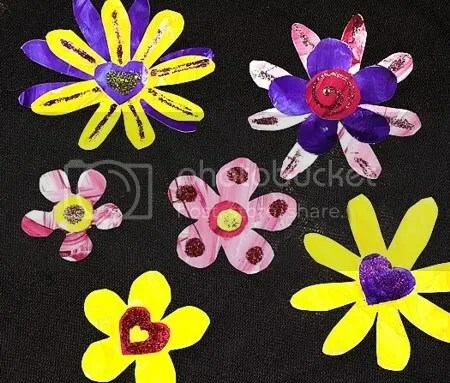 The others were smaller, and she only used 1-2 colors. . .T knew who the recipient of each piece was to be, and frequently repeated; ‘I makin’ dis for ___________” as she worked. I doubt that it had any influence on how she painted them, but it was rather adorable! 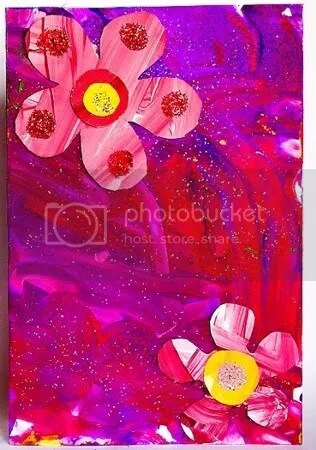 Obviously, this is the most excellent step, because who DOESN’T love making a huge sticky painty mess sparkle and shine? Glitter is the magic of the mundane world – especially for girls. The stuff is *almost* as amazing as chocolate, and quite frankly Puff and I adore it madly. Everyone loves a baby’s paw print, and every baby I know loves to create them, so this is a win-win situation for anyone who isn’t involved intimately with the janitorial aspect. 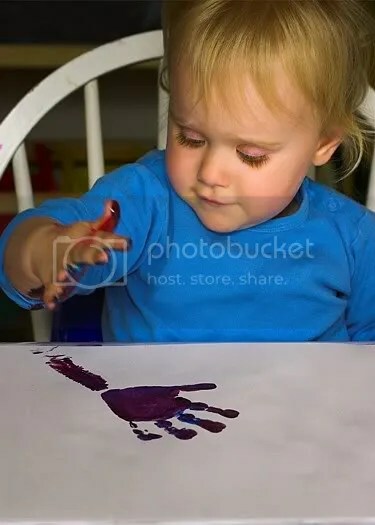 After the first round of paint and glitz dried, T gets slapped into a new smock and we go for round 3 – hand prints! 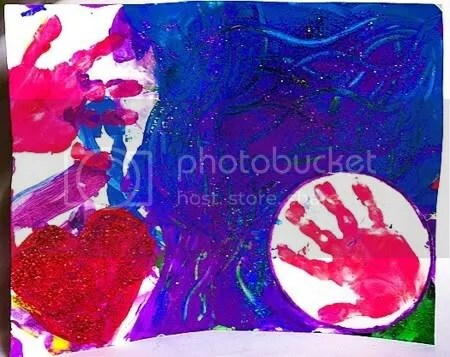 There is a technique to creating the perfect hand print for one as small as Puff, and I’ll enlighten you. 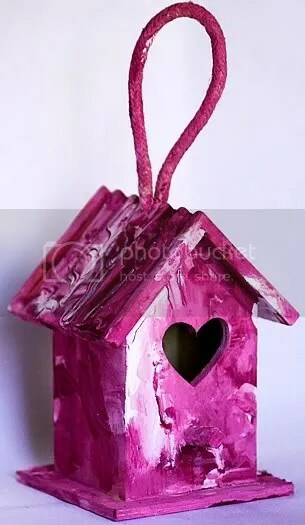 First, spread a very thin layer of paint in the desired color(s) evenly onto a flat surface. 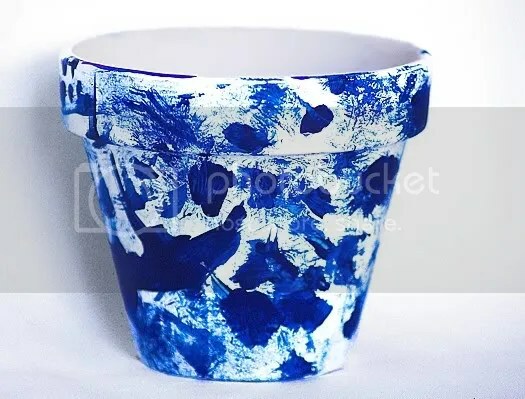 Next, get the child very excited about ‘smacking’ the paint and paper – in that order. 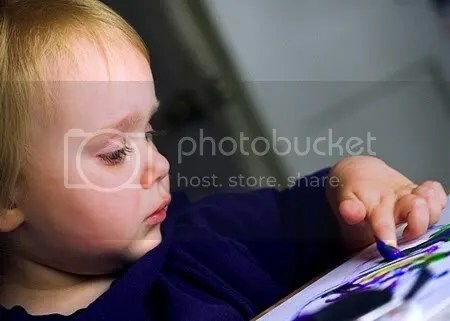 Attempting to guide your child slowly through this process will result in failure and smeared fingers every time, I assure you. I’ve tried this method with babies as young as 6 months, and it works brilliantly. The reason for this is that, by nature, kids are violent. They get such delight out of beating things around, and hearing the noises that are created as they do so. Add a splash of color, and you’ve created the most amazing game ever. 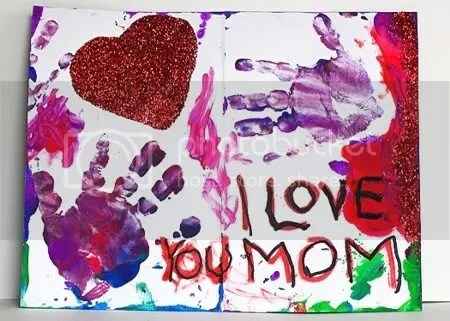 As a general rule, it is a bad idea to let a child add a hand print to an otherwise finished piece. Inevitably, print will be missing fingers, and you’ll end up very sad. 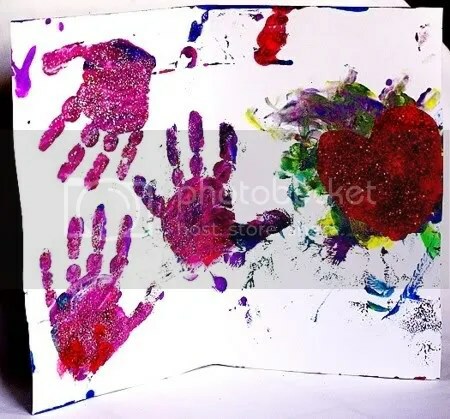 For this reason is a rather good idea to let the baby whack away on a clean sheet, and cut and paste the hand print you deem worthy where you feel it ought to live. We did a bit of both this time, as Puff’s hand printing is nearly at a professional level after so many months of practice. . . This, of course is a sacred duty that I, as mother, am obliged to take on. Unfortunately for the ill-fated paper, I am notorious for being wholly incapable of cutting a straight line. . .for this reason the cards ended up being of wildly different proportions. The good news is that no two will be dwelling in the same house, so my affliction can remain a secret. First, I snip the larger and more colorful paintings into rectangles, which we fold in half to create the actual cards. Next, I cut the smaller ones into shapes. 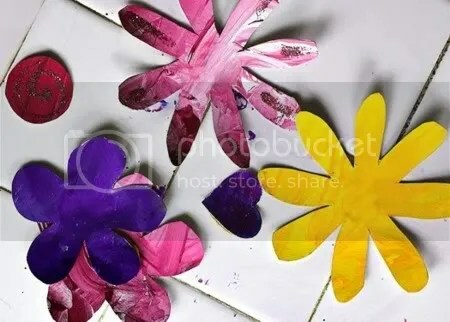 I made 2 types of ‘petals’ and various sizes of hearts and circles. . . I added a bit of glitter to these while T was napping, I like to play too! Many regard me as insane, and my daughter’s use of glue has been pointed out as proof positive of my mental illness. I must confess that I in no way understand this point of view. I see no harm in allowing Puff to use glue. She’s belted into a booster seat, and I am at her side, where is the harm? The sticky stuff has all the qualities we search for in children’s products; nontoxic, washable, and best of all – it dries CLEAR! Clear means pretty damn near invisible, which in my mommy book equals a wonderful thing, bringing the rank of glue miles above those of paint and glitter. I’m not sure how well T understands the glue phenomenon. She gets that puts a bit of glue down and then puts something on top of it, but I don’t think her tiny head grasps the concept that the glue binds one thing to another. 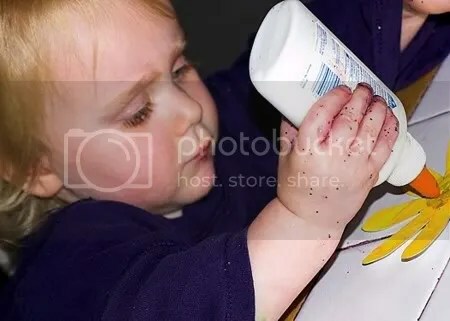 I suspect she is of the opinion that glue is nothing but white paint that for some unknown reason, I allow her to pour directly from the tube. Either way, she does a great job with it! 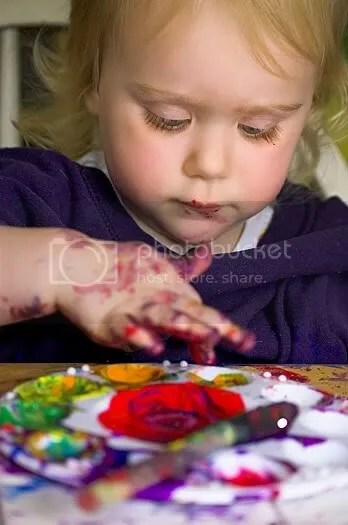 She loves making flowers, (we’ve done this before). She gets so intent upon choosing which piece should go on next. . .its astounding to witness someone so small being such a perfectionist. All of her flowers are different when complete. I admit that I straighten them out a tiny bit once she’s done with them, but for the most part, she’s fantastic about getting the centers in the middle! 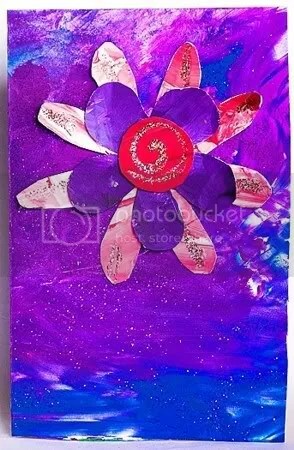 After the flowers are finished and dry, T chose which ones should go on which cards, and glued them on. 6: Put it all together! Next on the list of stuff to do was the painting of some small gift for each grandmother. The toughest part about actually painting usable things, is that poster paints would never do. Mommy broke out the REAL acrylic paint, and watched Miss Puff like a hawk. 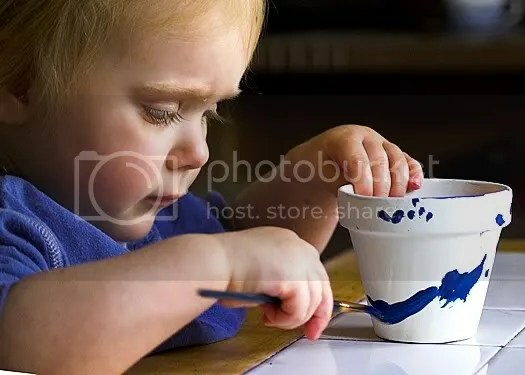 She did REALLY well, and even stuck to using the paintbrush. . .for the most part! As her mother, I’m the first to admit that my baby has mad skills, but even I know she can’t pull this design off, but she didn’t mind giving it her best try! Nonna also likes plants. 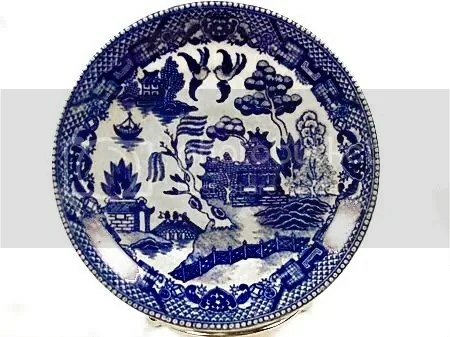 . . so I figured T could make her a tiny Blue Willow-esk flower pot. I painted the pot white while she was napping, to give her a clean start. Nonna was thrilled with T’s attempt at duplicating her most favorite thing, and didn’t even have to be told that it was supposed to be Blue willow, she knew the moment she saw it! Three cheers for SuperPuff! My a personal request on mommy’s special day was to be allowed the rare privilege of nap taking. A brief respite from the eternal role of mother to slip sweetly into slumber. It was refreshing, to be sure, and while I dozed, Daddy was patiently training our little sprout to greet me with a resounding ‘Happy Mother’s Day’ upon my awakening. It was adorable to be greeted in such a fashion, to be sure. And then she watched in amazement as I melted into a puddle of love and adoration at her feet. . . I hope you all had a very happy I love Mommy day! “Happy I love mommy day” How keeeute is that?! T’s such a doll!